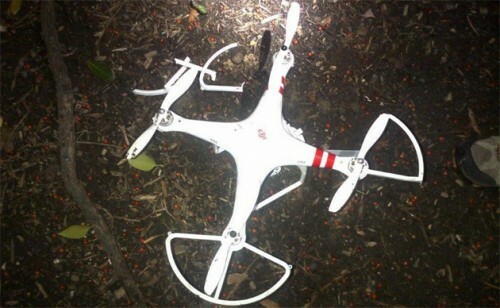 Just a few days ago a DJI Quadcopter crashed on the White House lawn. The photo above is courtesy the Secret Service. The company has issued a firmware update for its Phantom2 drone that prevents it from flying within a 15.5-mile radius of downtown Washington, DC. FAA guidelines also bar any unmanned vehicles from flying in that area. The pilot was a young man who flew the drone from an apartment window at 3 a.m. Then he flew it back in the apartment. Then he did it again. The third time, however, it hovered for a couple of minutes, but would not respond to the commands from the controller. Suddenly it shot up hundreds of feet before it took off heading east, toward the White House which was less than a mile away. No one has reported seeing the crash. Apparently this kind of control loss is not uncommon. A company spokesman said that there are safety features to prevent this kind of thing. They only work if the system has been calibrated by the user. DJI Prevents its Drone From flying in Washington.